Get ready to jump for joy when you rent this Tiger Belly Bouncer. The vibrant orange and stripes of black will make for an eye catching inflatable at any event. 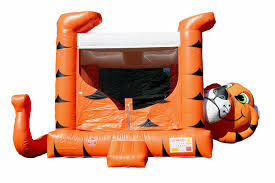 The tiger bouncer has a friendly smile on its face, a large tail, an even larger bounce area, and safety nets on all 4 sides of the inflatable. There is also a safe inflated entrance/exit so the kids won't hurt their paws while having fun. Get ready to hear the little ones roar with excitement when they see you've rented the Tiger Belly Bouncer for your next gathering.